CONSTRUCTION - Accoriding to someone who worked at the FIDM costume exhibit, the back of the bodice is laced up the back like a corset. It seems that there is not a seperate corset underneath, but a corset structure may have been worked into the bodice just underneath the outer layer. FABRIC - The bodice of this costume is most likely made of some sort silk. After looking at it at FIDM I don't think it's as smooth as charmeuse. There is a very slight texture to the weave that can be seen in this photograph. It might be taffeta, or this stiff bridal silk that is sold at Britex and Satin Moon in San Francisco (it has a steep price tag of nearly 100 dollars a yard! I'll jot down the name the next time I'm at the store). I made the poor choice of using cheap purple satin acetate. If I had it to do again I'd use silk (or at the very least a washable polyester). The drawbacks of acetate fabric are numerous. a) It stains the minute water or sweat gets on it. The fabric must be dry cleaned because spot cleaning with water only leaves large marks. b) The fabric does not breath. I was fine at an air conditioned convention for several hours, but when posing for photos in my hot house in the summer I fell faint. c) The fabric does not drape well or press well. d) It is very reflective and photographs poorly. I flatlined the acetate with cotton broadcloth, and lined the bodice with polyester lining. Nylon boning was inserted along the princess seams, and hook and eye tape was used to close the back. SEQUINS - The upper part of the bodice is hand beaded with over 1000 black iridescent sequins held in place with iridescent seed beads. 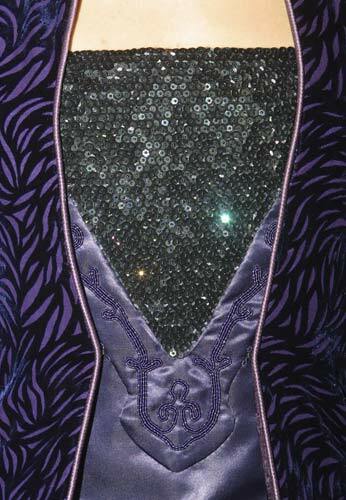 I used 6mm black iridescent cupped sequins from Britex. The real costume may use slightly smaller 5mm which can be purchased at cartwright's sequins. EMBROIDERED APPLIQUÉ - The sequins are bordered by a V- shaped appliqué embroidered with corded cornelly work. 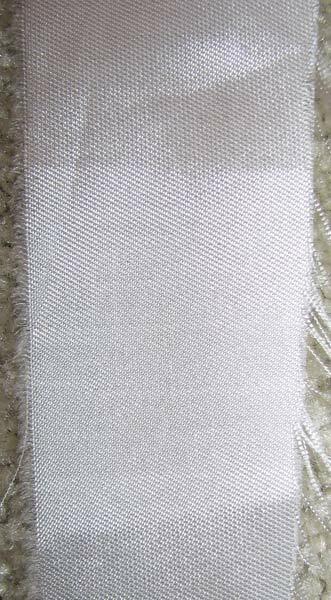 It looks like the primary thread used for the embroidery is rayon, with a secondary metallic thread worked into the embroidery to give it sparkle. There are no beads used in the corded embroidery work. 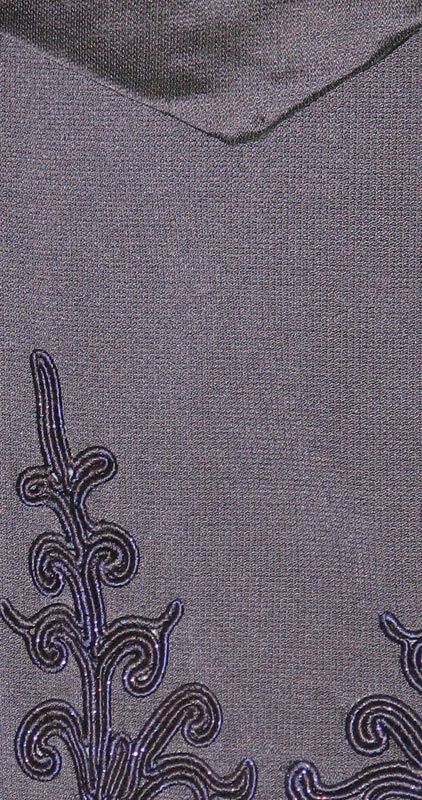 Since I don't have a cornelly embroidery machine, I've found the best way to simulate this work is by using rayon bourdon cord and couching it with metallic embroidery thread. CLICK HERE FOR MORE INFORMATION ON EMBROIDERY >. PATTERN USED - Simplicity 8881 - heavily modified and altered. The sleeves were drafted by me, using the Simplicity pattern as a guide. 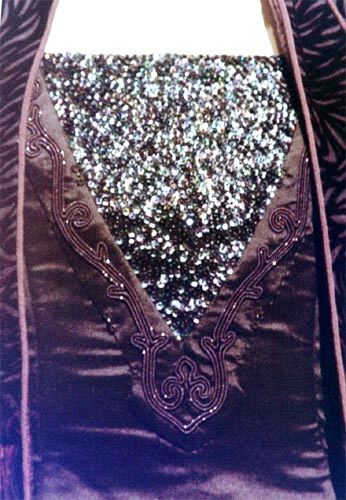 This close-up of the bodice on display at Celebration II shows that 4 hooks and eye bars are used to keep the coat in place while Natalie Portman wears the costume. However, the hooks and eyes probably didn't line up correctly on the dressmaker form so they were left undone (I experience the same problem when I use my dressmaker form). I purchased my hooks and eyebars from Lacis. They were painted with purple acrylic paint, but it has started to chip off. I may switch them with black hooks and eyebars available at Sew True. The bodice has a doubled sleeve. The outer sleeve is a bell shape and is embellished with embroidery work similar to the skirt tabard. 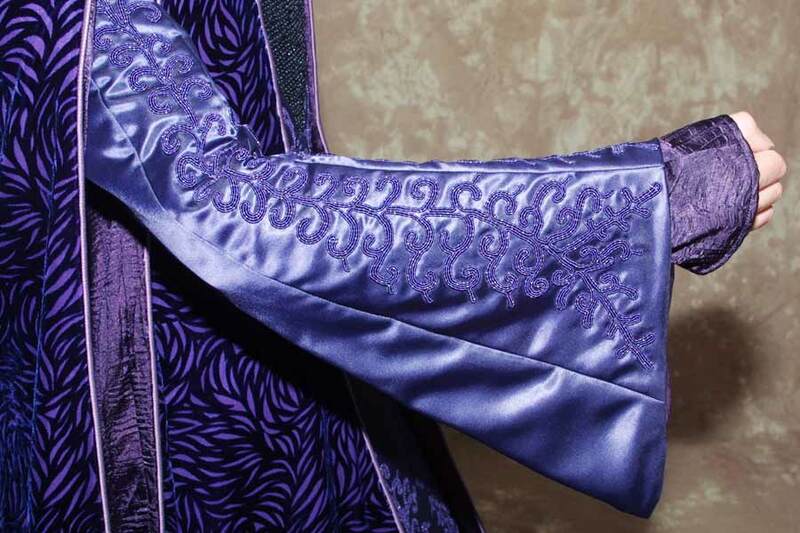 The outer sleeve is lined with a dusty purple fabric which seems to match the fabric used on the piping of the velvet coat. The inner sleeve is fitted with a small flair at the base around the hand. 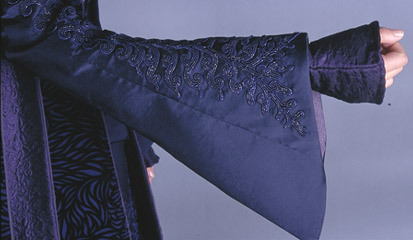 The fabric is crinkled in texture and is the same fabric used to line the velvet coat. In order to keep my bell shaped sleeve from collapsing, I used 1/4" horse hair braid on the inside of the hem. Perhaps this step isn't needed I may have had a smoother look without it. Roughly 50 yards of hand dyed bourdon cording was used to embroider the 4 sleeve panels.